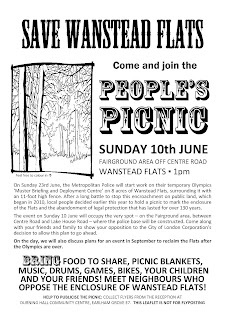 Following a public meeting in mid-January, the idea of another community picnic on Wanstead Flats (like the one we held on 5th September 2010) has been floating around for a while. The intention was to mark the start of the occupation by the Metropolitan Police of eight acres of the Flats for its Olympics operational base, with a reminder of the opposition to the enclosure of public land - and to repeat this with an event to 'Reclaim the Flats' after this summer's Games are over. But over the last two weeks, volunteers have suddenly come forward and more and more people have said that they don't want the start of the construction of the police base to pass without comment. So the picnic is back on - and it's an opportunity for everyone who campaigned so strenuously to stop the flagrant misuse of Wanstead Flats to join together in a celebration of why we value our common land so much. So come along on Sunday 10th June at 1pm, to the Fairground area between Centre Road and Lake House Road. Bring food to share, picnic blankets, music, drums, games, bikes, your children, your friends and your neighbours. This is the last opportunity to collectively show our opposition before construction begins on 23rd June - so pick up some leaflets from the reception at Durning Hall Community Centre or download from here and pass them on to your neighbours. And finally - I really hope that the couple in the cow suits (below) who came to the 'Take Back Wanstead Flats' protest can make it along again!